Beets are by far my favorite root vegetable – and that’s even with stiff competition from sweet potatoes. It is one food trend in recent years that I will stand behind, yet I am one of those weirdos that has loved beets long before the beet salad became a given (next to Brussels sprouts and kale) in farm to table restaurants. Beets, along with broccoli and canned peas, were probably the only ‘vegetables’ I would touch as a very picky child. I’m pretty sure I inherited my odd affinity for beets from my father, though my maternal grandmother often served them at Sunday dinners. As a kid, I clamored for canned beets, and especially for Ukrop’s (a now sadly defunct local supermarket chain that few, if any of you, will know) marinated beet salad. Molly’s beet salad, a Whole Foods salad bar staple, can’t touch that! Beets, beetroot, or “peet” in Estonian – is omnipresent in Estonia and, to a slightly lesser extent, throughout the Baltic region. So you can imagine my delight to find beets on almost every menu in Estonia: Pickled beets at my breakfast buffet! Beets in my Vapiano fast casual salad. Roasted beets in my vegetable side dish at more dinners than I can count. I even found paleo-friendly, vegan “peeditoorleib” (raw beetroot bread/crisps) in a local grocery store – a bit stale/chewier than I might prefer and slightly bland, but with the unmistakeable earthy sweetness of beets (below). Estonian paleo-friendly “peet leib” – beetroot bread made with seeds and a touch of seasoning. So, for the beet-shy, what’s in it for you? Acquiring a taste for beets might enhance more than your palate; the nutritional benefits are many. A 2012 study found that consuming beet juice 75 minutes before a 5K run increased runners’ performance, particularly their pace the last kilometer. Beets – especially their bitter salad greens – contain naturally occurring nitrates (yes, the same compound found in fertilizer, not the processed preservative nitrite), but, more importantly, antioxidant and anti-inflammatory compounds called betalains, which give beets their characteristic red-purple color and may inhibit growth of some types of cancer cells, including colon cancer. So detox away with beets – but make sure not to overcook them, as the betalains break down quickly with heat. My favorite way to enjoy beets is pickled; the vinegar balances the beets’ sweetness and breaks down their tough flesh. Many of you have probably seen the typical fad beet salad – red and often yellow beets, thinly sliced, served with goat cheese and a light salad green, such as watercress or arugula. I will never turn down a beet salad, but they often seem a bit tired or unoriginal. 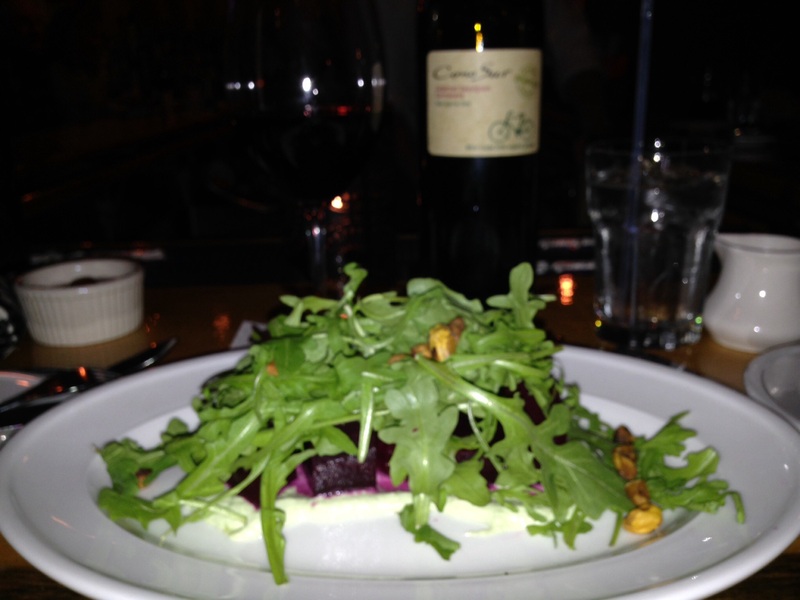 I did recently try a wonderful ginger-marinated beet salad with scallion creme fraiche at, of all places, a ski resort in Maine (Sugarloaf’s 45 North) that made me a bit less of a beet snob. Of course, one can always go traditional Russian with some borscht. The most authentic versions are full of meat, creating a dish substantial enough for a full meal, such as the one served at Riga, Latvia’s Uncle Vanya. Perhaps the most innovative — and unexpectedly delicious — use of beets was a cousin of the veggie burger composed of pureed beets, chickpeas, and carrots at Estonia’s Kohvik Komeet – think a slightly less over-the-top Cheesecake Factory, served over a warm lentil and sun-dried tomato salad and topped with hummus (photo at the top of the post). I attempted to recreate this dish for this blog, but attempt #1 fell far short of Komeet’s and is not ready for a recipe posting yet. How did I fail? I attempted to puree the ingredients with an immersion blender, which did not leave it smooth and light enough in texture; I was trying to keep it vegan but believe egg would make a good binder; and pomegranate vinegar was a horrible touch. It wasn’t terrible, but not ready for prime time. I know, I know, you were really looking forward to a recipe for a bright red-purple,vegan veggie patty, right? 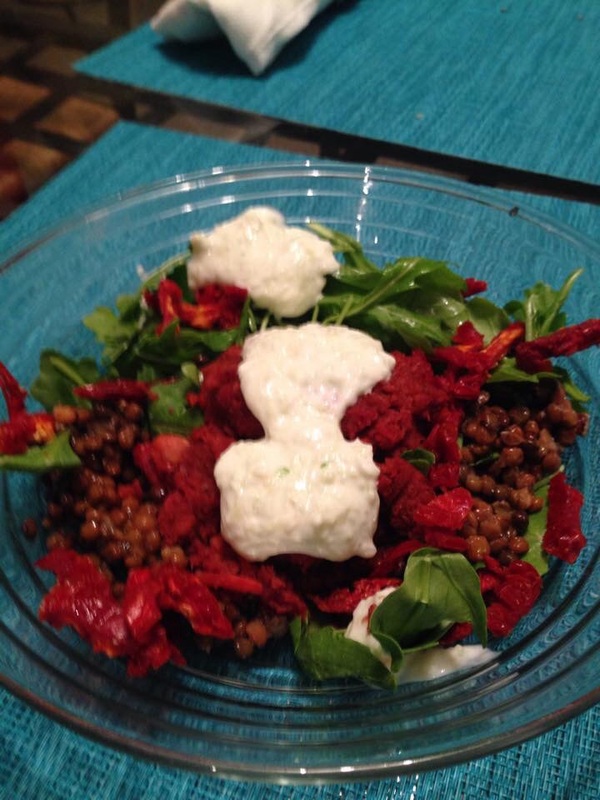 My first attempt to recreate Kohvik Komeet’s beet, carrot, and chickpea patty, served over arugula, sun-dried tomatoes and lentils and topped with my homemade tzatziki. At least it looked pretty! Pickled beets with a touch of sour cream…yum!